The Tissot history of innovation is long and multi-faceted. This pioneering spirit has impacted both on product development and commercial activity since the company’s foundation years in the 1850s. In 1866 after having developed commercial relations in the United-States, the founder’s son, Charles-Emile Tissot, bravely ventured to Russia and sold Tissot pocket watches across the empire, then a far more receptive market than Switzerland. Tissot went on to gain a coveted Grand Prix award in 1900 in Paris. At the same time, Tissot pioneered a long history of collaboration with ambassadors, with one of its wristwatches being worn by the iconic actress Sarah Bernhardt. Tissot timepieces have pioneered new shapes and materials to keep the brand ahead of its times. In 1916 the Prince ‘Banana’ watches incorporated a curved case and Art Deco styling to the delight of European and Russian customers. An innovative approach to materials led to the production of the world’s first plastic mechanical watch, the Tissot Astrolon, in 1971 and the iconic Tissot Rock Watch in 1985, made of stone from the Swiss Alps. The inspiration of nature showed its face again in 1988 in the form of the Tissot Wood Watch to celebrate the 700th anniversary of the Swiss Confederation. 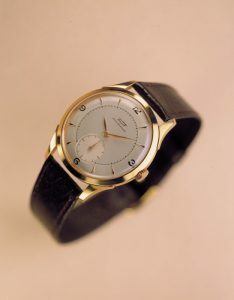 In 1991 Tissot used ceramic in its Tissot Ceraten timepiece and 1998 saw the use of high-tech titanium in a model aimed at younger wearers, Tissot Titanium 7. Parallel to the long list of product firsts is a dynamic history of brand communication, from memorable campaigns, such as the 1965 Tissot PR516 advertisement introducing the lasting Tissot love of motor sport, to global collaboration with brand ambassadors and direct involvement in major international sports events. The Tissot brand’s relentless commitment to innovation has always been more than skin-deep, with technological advancements playing a key role. In the 1930s Tissot introduced an Antimagnetic Watch to resist the then modern influences of telephones and electrical equipment. In 1953 the Tissot Navigator mastered timekeeping in 24 time zones around the world. And in 1986 the Tissot Two Timer revolutionized watch making, containing both analogue and digital displays, with the movement and the pace in one piece. In 1999 Tissot introduced a breakthrough tactile technology, giving birth to the Tissot Touch Collection. The dynamic watches in the Tissot Touch Collection integrate a touch screen crystal, which is the interactive ‘cockpit’ of the timepieces’ diverse functionality. The Tissot Touch has continually strengthened its technological leadership by bringing this tactile innovation to a wide range of contemporary designs. A light touch of the innovative tactile crystal on any of the Tissot Touch timepieces – Tissot T-Touch, Tissot T-Touch Expert, Tissot Touch Navigator, Tissot Touch Silen-T – enables access to a variety of useful functions, ranging from a chronograph to an altimeter. Tissot takes its tactile technology to new limits in 2009 with the introduction of the Tissot SEA-Touch, a high performance watch for divers with water resistance to 200 metres.